Students plant their own pot of clovers, track growth and learn the plant life-cycle. 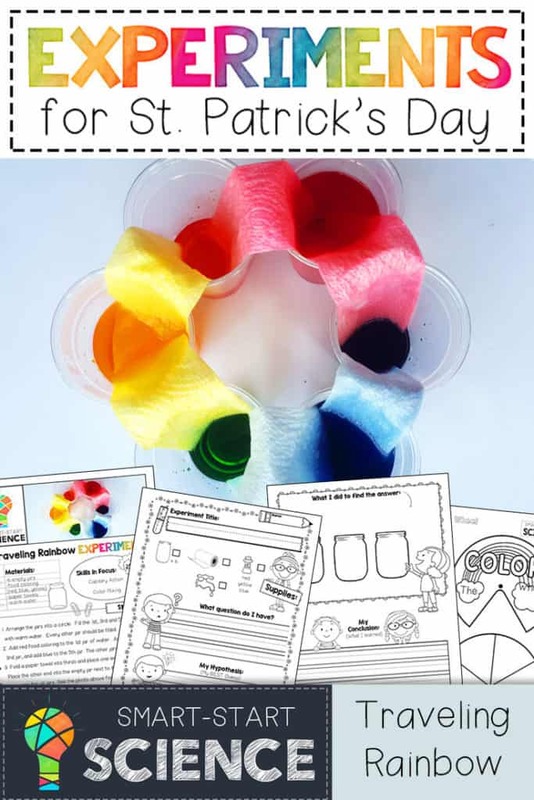 With this super simple experiment children learn about capillary action and color mixing. Students build three different boats and put them to the test. The boat that holds the most gold wins! 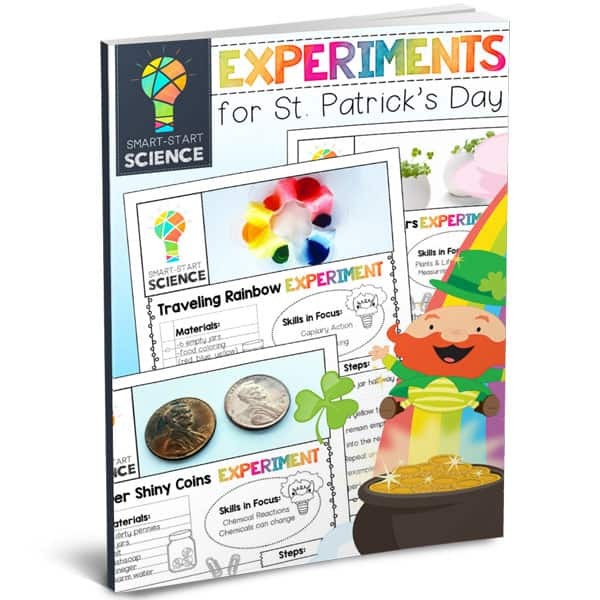 Leprechauns want their gold super shiny and this experiment will lead students through a test to see which chemicals will react together to make the perfect cleaning solution. Students estimate and graph how many lucky marshmallows they find in their scoop! 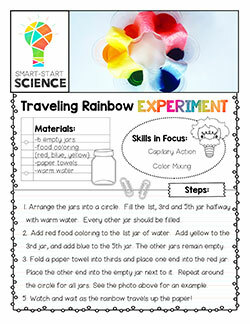 This sheet features a full color photo example of the experiment, skills in focus, materials list and step by step instructions for completing the experiment. 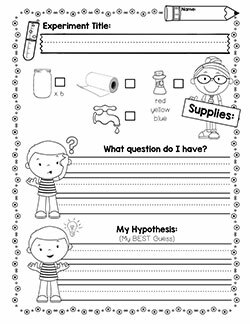 Students gather materials, form questions and develop a hypothesis. Students track their data or draw their procedure and write in their final conclusion. 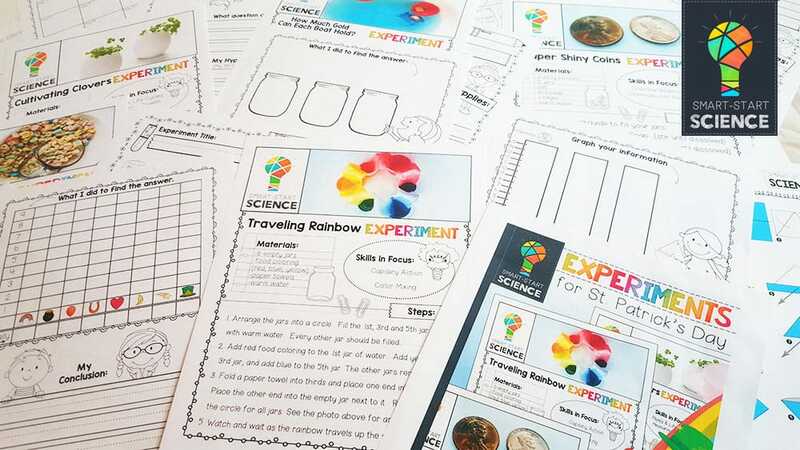 Each experiment includes a unique activity to follow up the experiment. 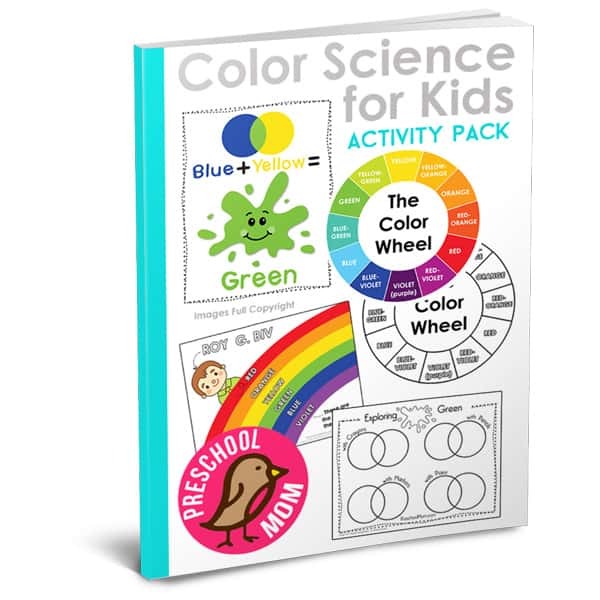 Many are hands-on, fun and relatable projects, games or handouts for students to try at home. We’re giving away 5 copies to 5 lucky winners! Where did the time go? It’s almost March and you know what that means…….St. 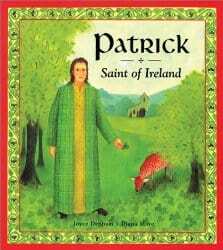 Patrick’s Day!! 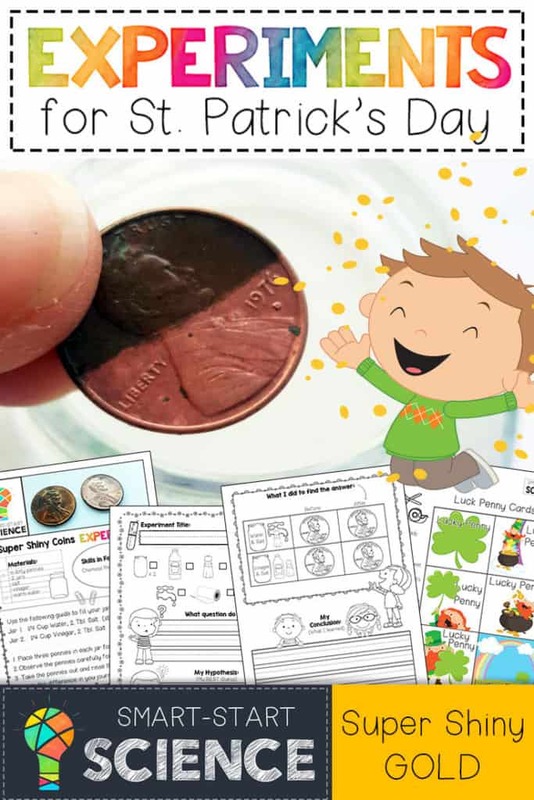 St. Patrick’s Day is a great time to teach children about the Holy Trinity and we’ve added our own spin on things by touching on the Beatitudes and storing our treasures in heaven. 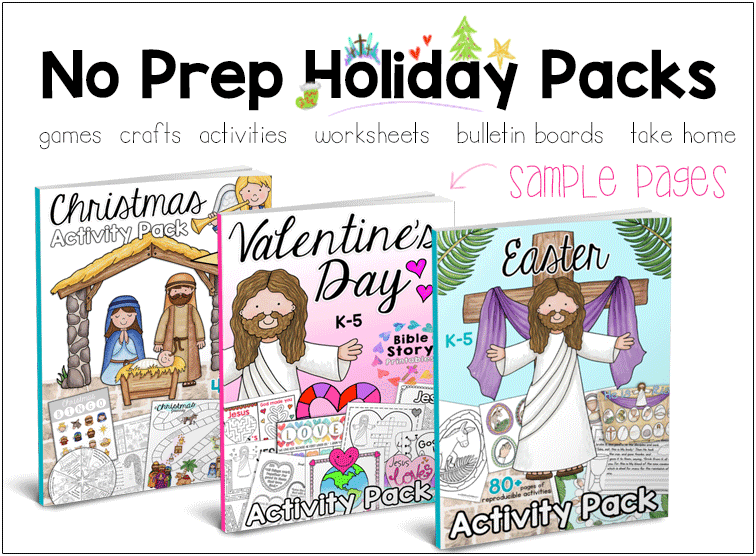 Our Holiday Packs are some of our most popular teaching resources because they are NO-PREP, available in an instant download and include TONS of hands on activities, games, crafts, printables and teaching resoruces for K-5 students. Each set comes with special take home activities too, making them perfect for Children’s Ministry and Outreach. You can purchase any or all of these sets in our Teachers Pay Teachers store here. 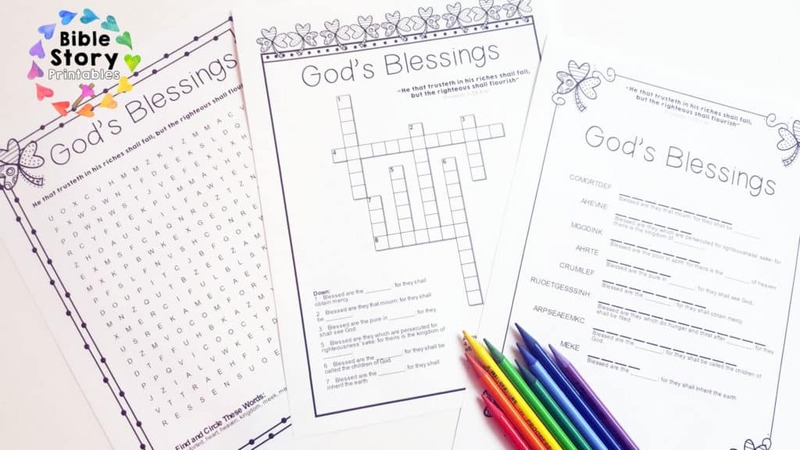 This set features the eight beatitudes and includes crossword, word search and word scramble. 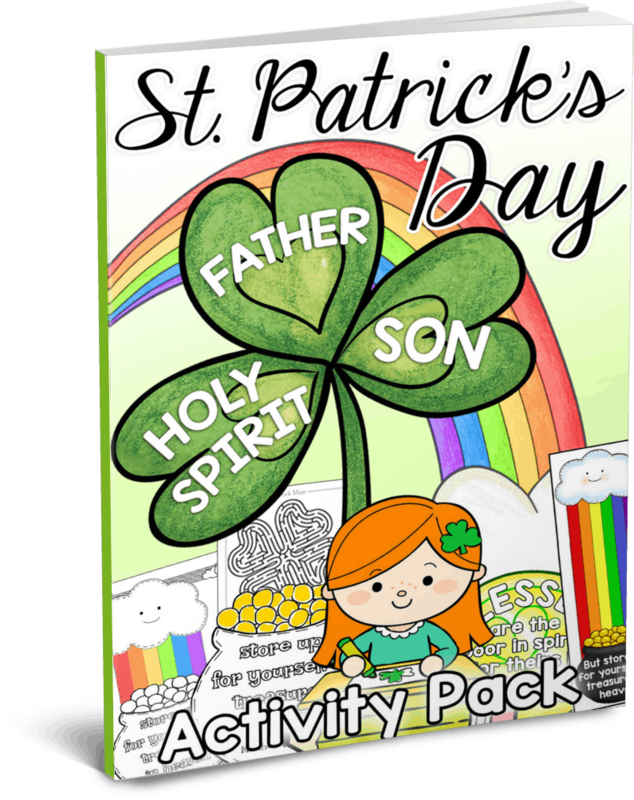 This set includes six different bingo cards featuring the beatitudes, scriptures and different colored shamrocks. 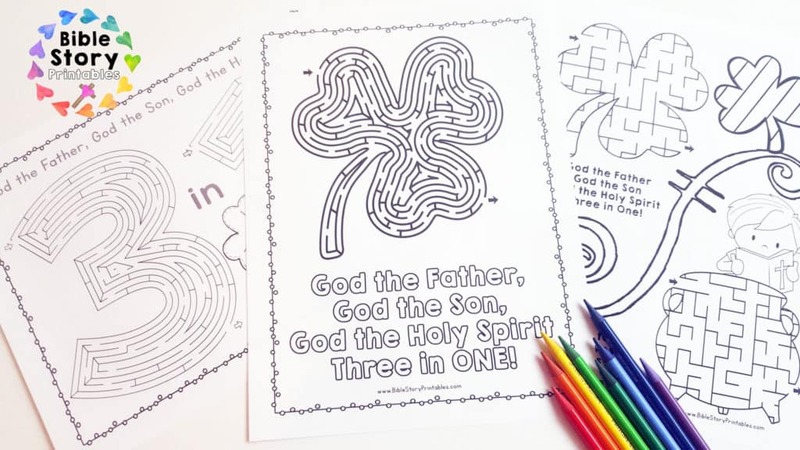 A collection of FUN St. Patricks Day Mazes with Bible verses. Print up these colorful bookmarks for take home treats. Play Tic-Tac-Toe with Chocolate Coins. A fun and easy multiplayer game. Be the first to collect all 8 beatitudes to win! 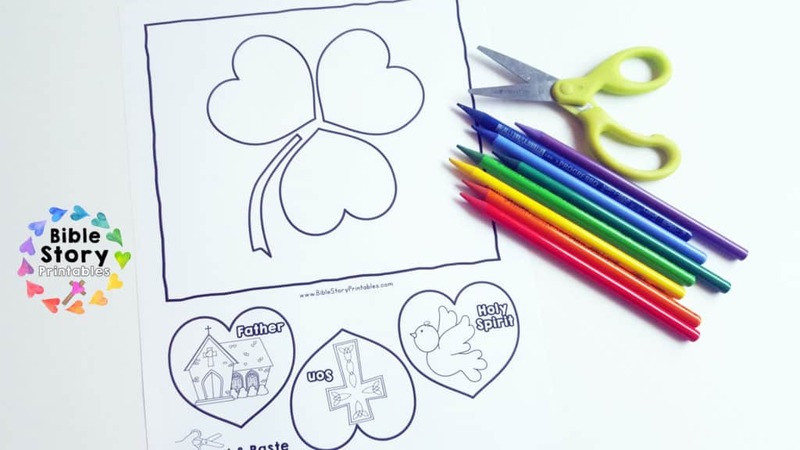 This trinity shamrock is perfect for older kiddos and involved a little bit of art. 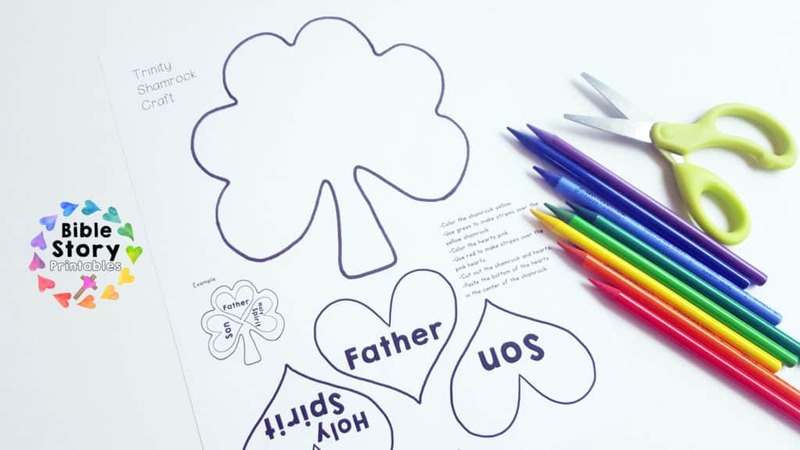 Children uses colored pencils or markers to design a plaid pattern across the shamrock. 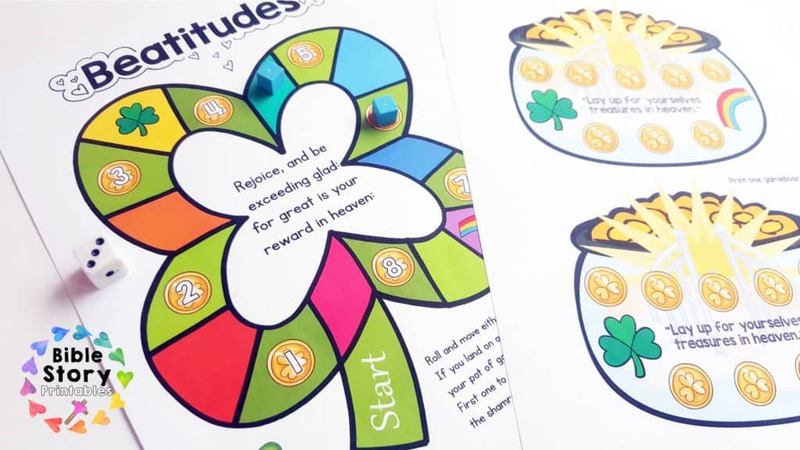 Colorful, printable coins you can print each featuring a different Beatitude. 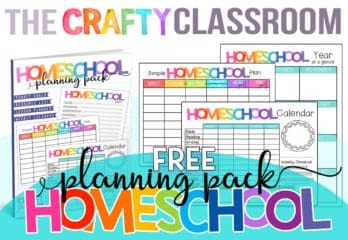 These are great for memorizing and can be sent home with children in a small envelope. 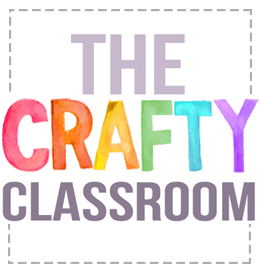 This is a simple craft that produces a colorful result. 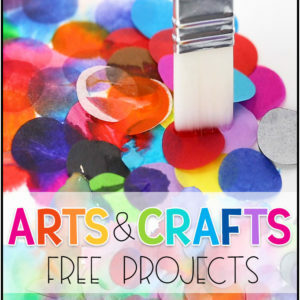 Provide children with strips of colored construction paper or colored streamers. Cut out and assemble together. You might even punch a hole in the top and hang them from your classroom ceiling. These simple tunes are great for early morning circle time and children love to sing along. 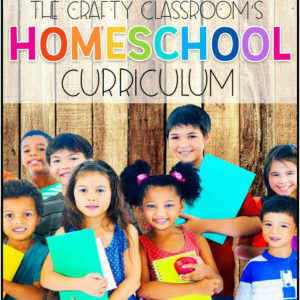 This pack is filled with multi-age resources which are sure to be a hit in your homeschool or Sunday School classroom. 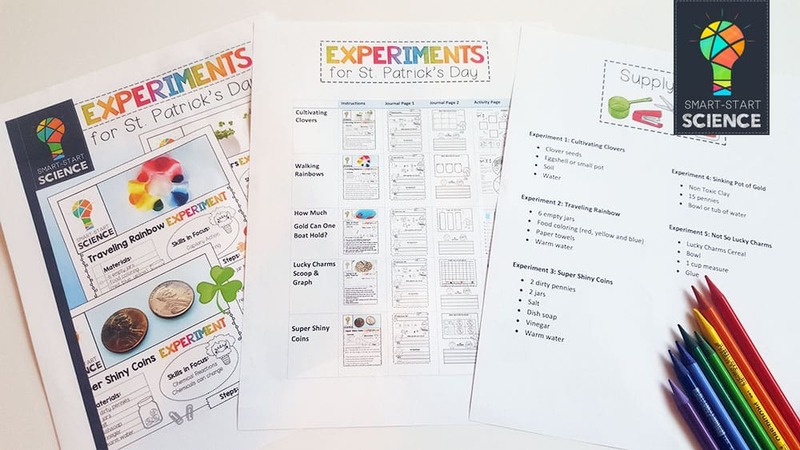 With St. Patrick’s Day around the corner (March 17th), I’ve got just a few more printable resources to share with you. 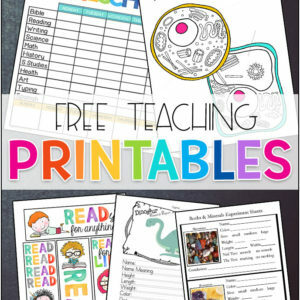 Print these resources Free from Preschool Mom. 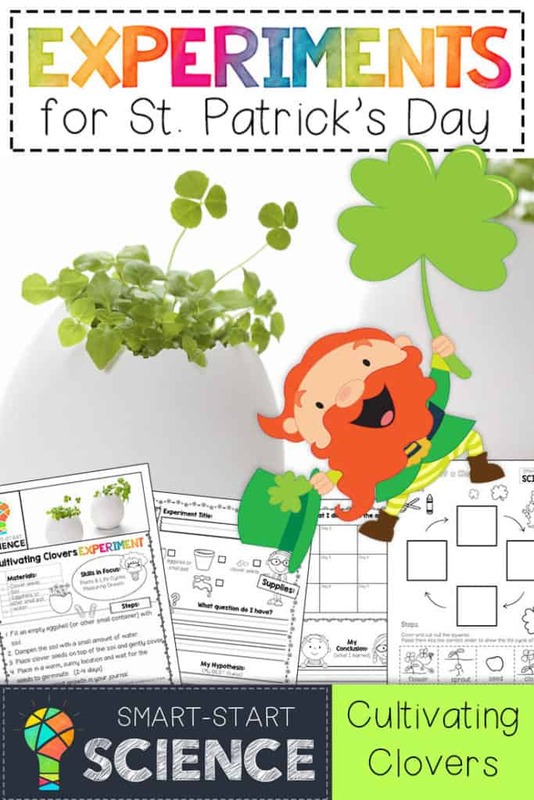 St. Patrick’s Day is coming soon and these free mazes and worksheets are just right for adding a little fun to your classroom. Each page features a challenging maze alongside an extra practice activity just to give children a little educational boost! 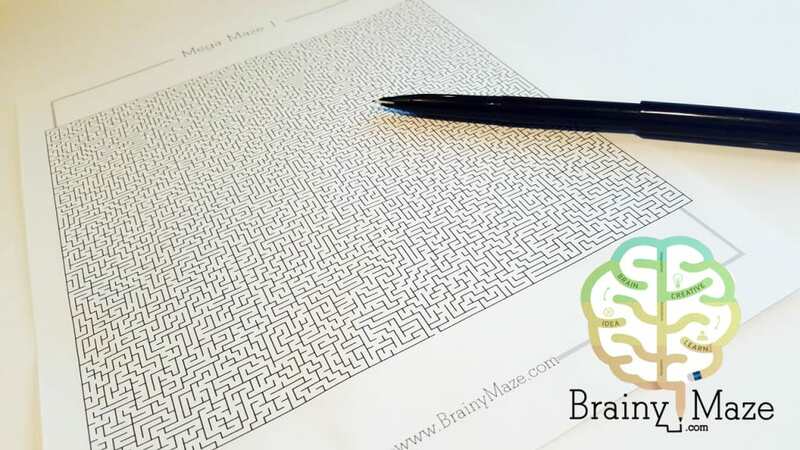 Mazes are great for building small motor control as well as building problem solving skills. 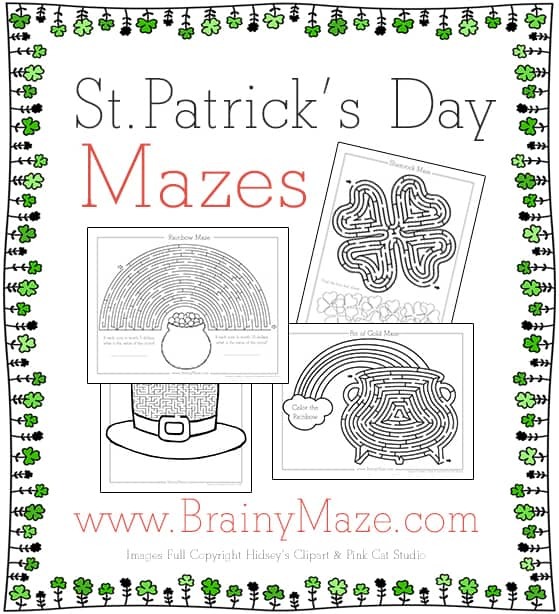 You can print these St. Patrick’s Day Mazes free at Brainy Maze. 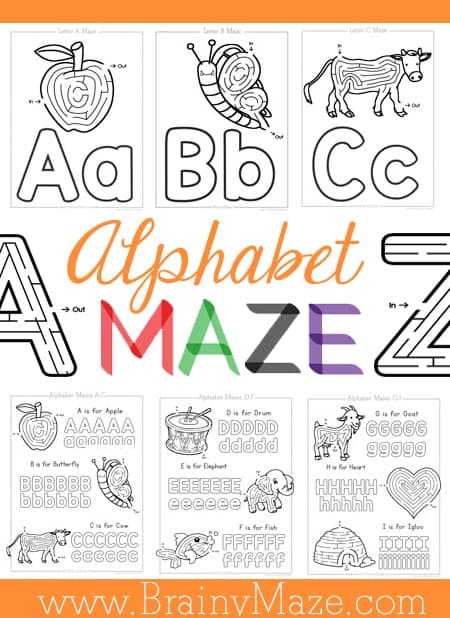 While you’re there, check out these A-MAZE-ING Alphabet Maze worksheets! 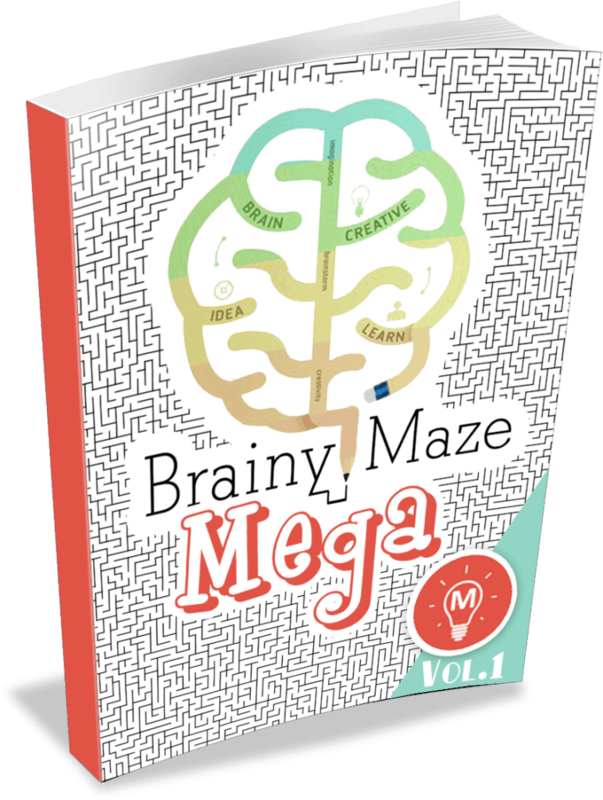 And if you have a Maze enthusiast in your house, take a peek at our Mega Maze eBook! With 50 intricate mazes this pack is sure to keep your child busy mazing for hours! 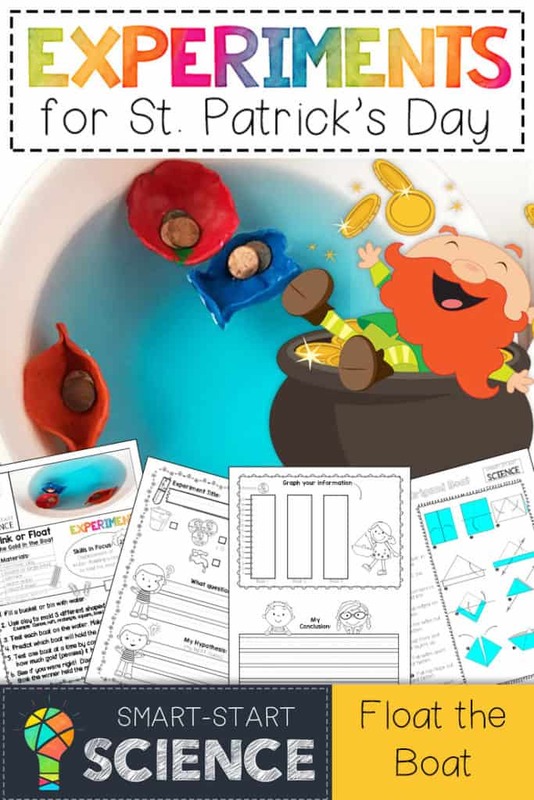 With St. Patrick’s Day around the corner I wanted to make a couple of new items you can use with your students this year! Now, if you missed our facebook update or our newsletter last week, you should know that Christian Preschool Printables will be under construction during the first couple of weeks of March. (If you’re planning on grabbing anything for St. Patrick’s Day or Easter please get it downloaded ASAP as during the update some of the links might not be working and I don’t want anyone to be stuck scrambling right before the holiday). 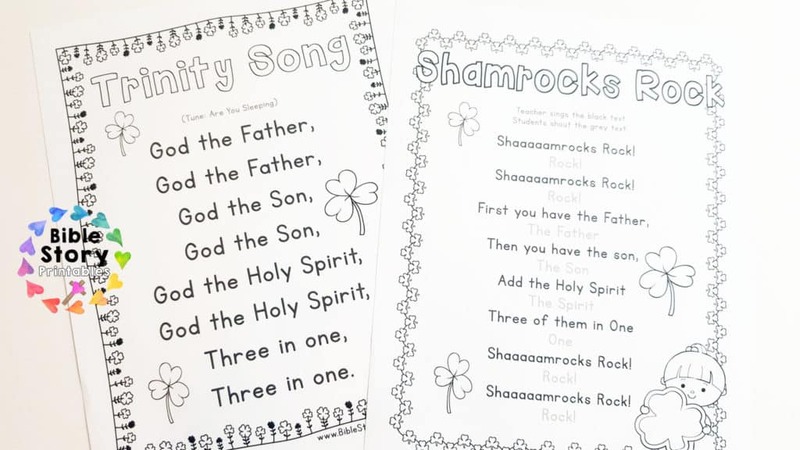 With that out of the way, here are some adorable new St. Patrick’s Day printables for you! 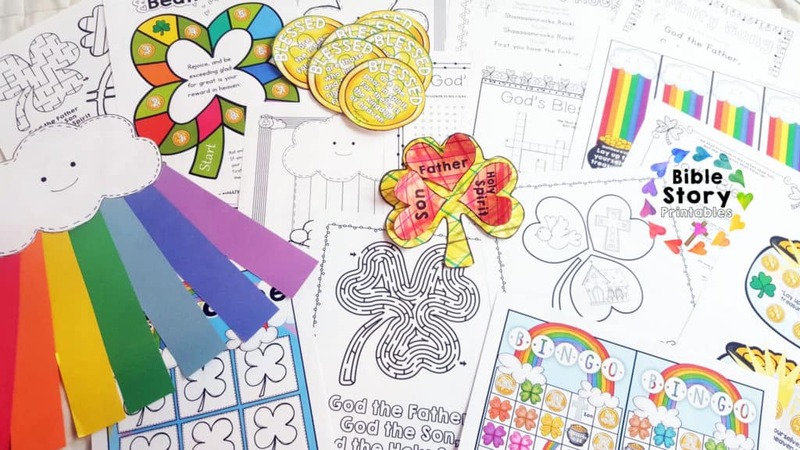 Treasures in Heaven Bible Craft: A simple yet stunning Bible craft for children to complete this St. Patrick’s Day. 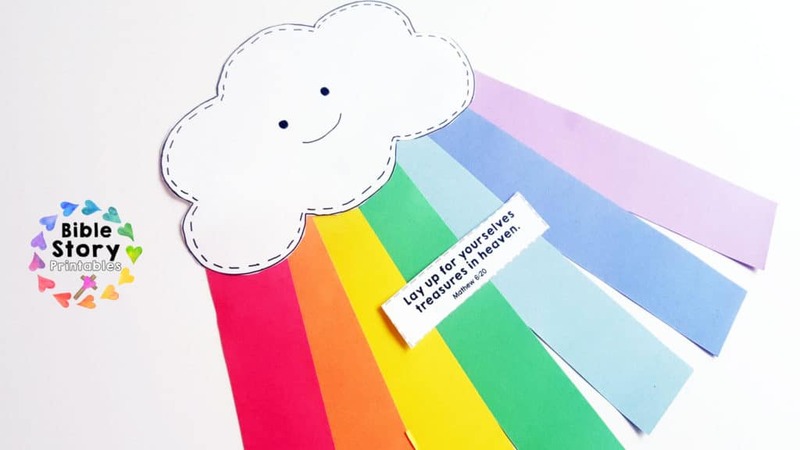 Children add rainbow paper or streamers to create a beautiful rainbow coming from the cloud. 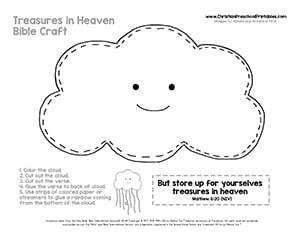 A scripture card is glued to the back to remind children that their treasure is in Heaven. 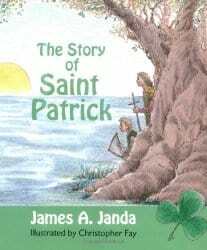 St. Patrick’s Day Bible Verse Bookmarks: A set of colorful St. Patrick’s Day Bible Verse Bookmarks for children learning to store their treasures in heaven. Print on cardstock and laminate for durability. 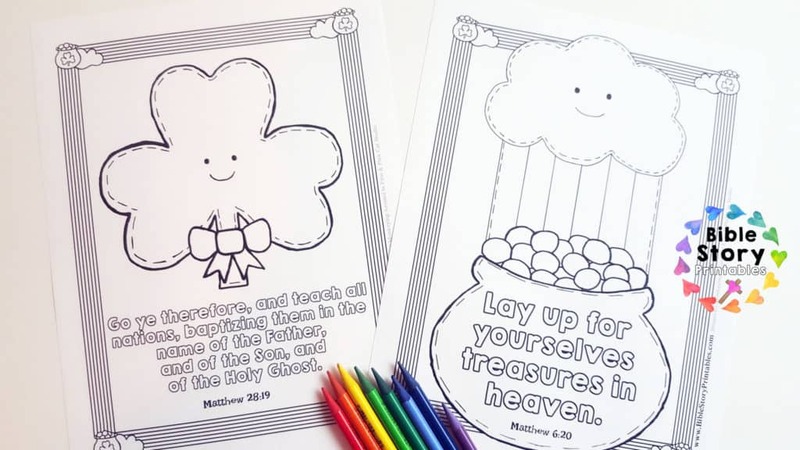 St. Patrick’s Day Bible Verse Cards: These take home cards share a special Bible verse from Matthew 6:20, “But store up for yourselves treasures in heaven.” There is room to tape on a small chocolate gold coin as a special treat. 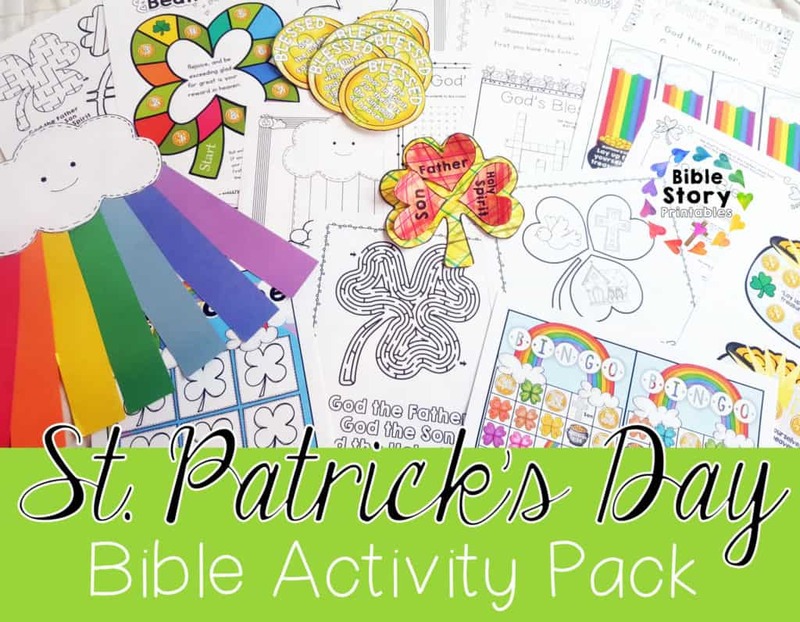 Hot off the press and ready for St. Patrick’s Day 2015 is this adorable set of five different Bible Verse coloring pages you can use with your kiddos this March. 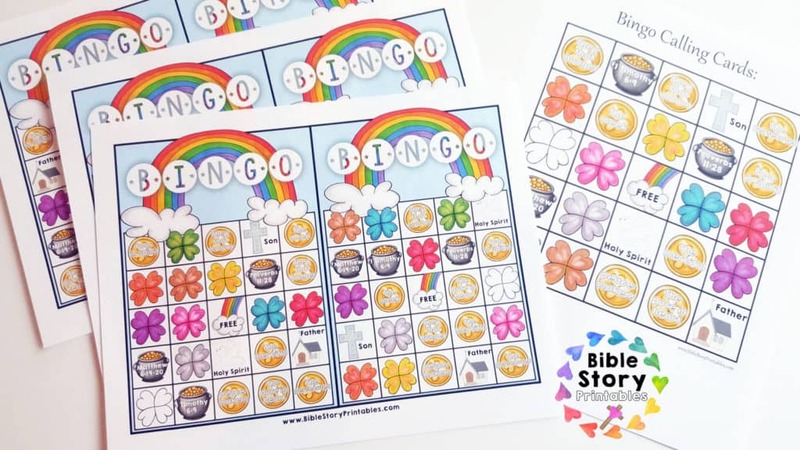 This set includes two different scriptures Matthew 6:30, and Matthew 28:19 and provides you with a variety of different pages you can present to children. 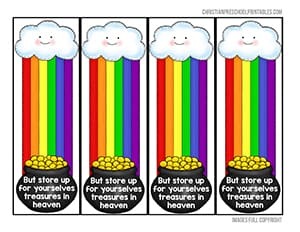 Instead of focusing on greedy leprechauns, St. Patrick’s Day is a great opportunity to teach children about the Trinity. 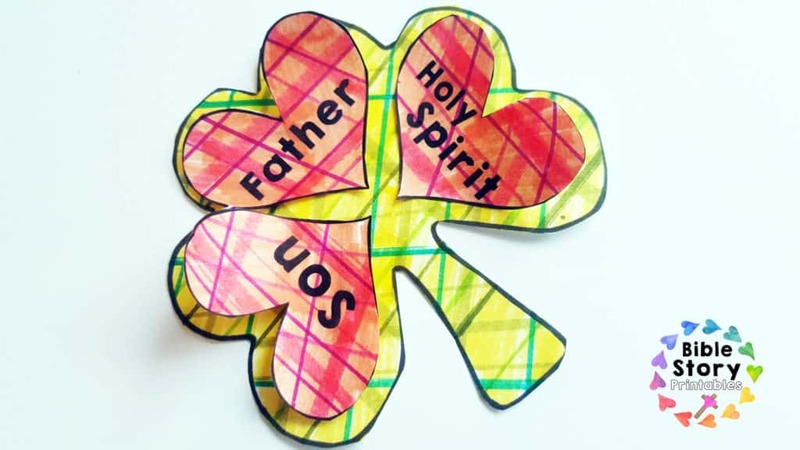 St. Patrick himself used the three leaves of a shamrock to explain the concept of Trinity by explaining that there was God the Father, God the Son, and God the Holy Spirit, all part of the same God. 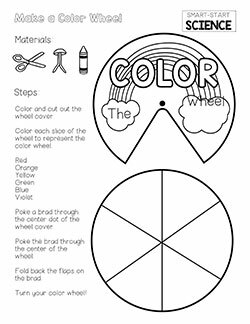 Today I’ve made a simple coloring page or craft you can use with your students. 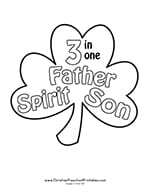 This is a printable shamrock with the three parts of the trinity written on the front. There is a small song sung to the tune of Frere Jacques that children can cut out and glue on the back. 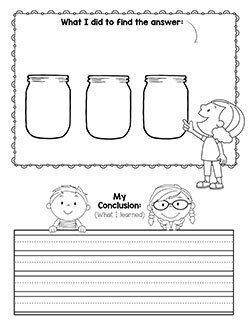 You can turn this into a classroom art project by printing on cardstock, cutting out the shamrocks and providing children with green and gold glitter to decorate their shamrocks. 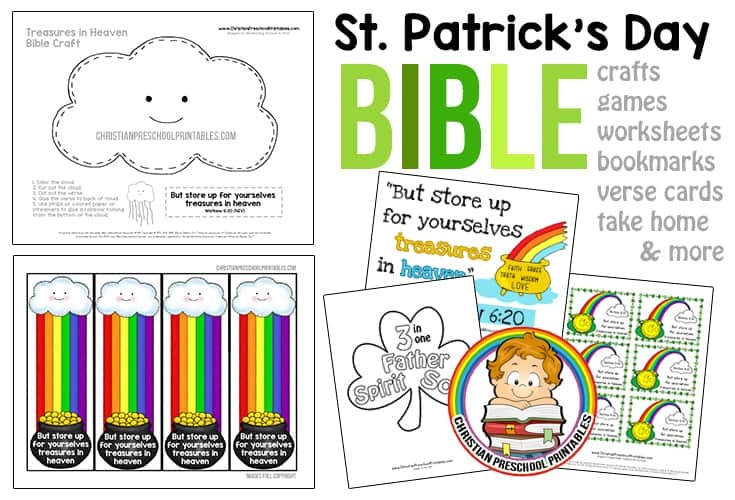 We’ve had such a great response to our Bible Verse Printable Theme Packs, that I decided we should add a set for St. Patrick’s Day! 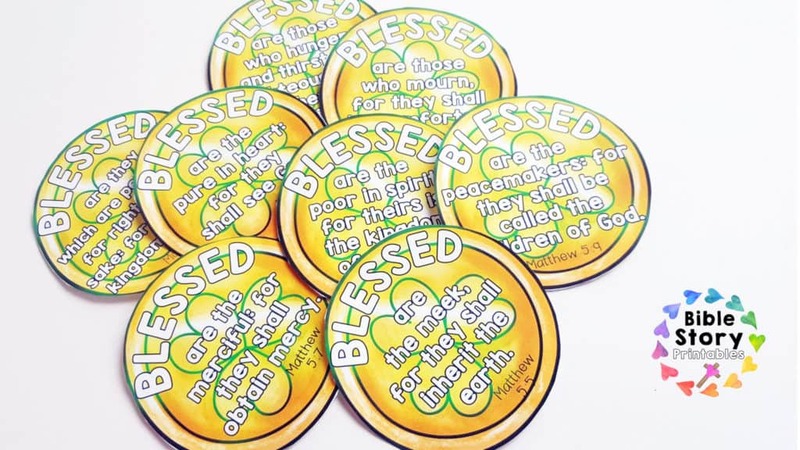 We currently have a ton of Trinity resources for St. Patrick’s Day, so I thought I’d switch things up a bit and make this set with the Beatitudes. So there are eight different bible verses, each from Matthew 5, and each representing a character trait that God holds valuable and blessed. 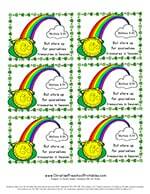 Â I printed them on shamrock coins, representing a focus on treasure in heaven and not earthly treasures. There is a printable pocket with a verse checklist on the back, these would be great to learn during the month of March! 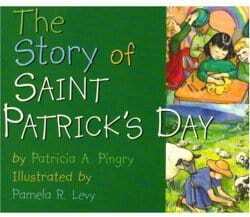 St. Patrick’s Day is on March 17th and I’ve added some new resources on our websites to help you teach this Holiday! 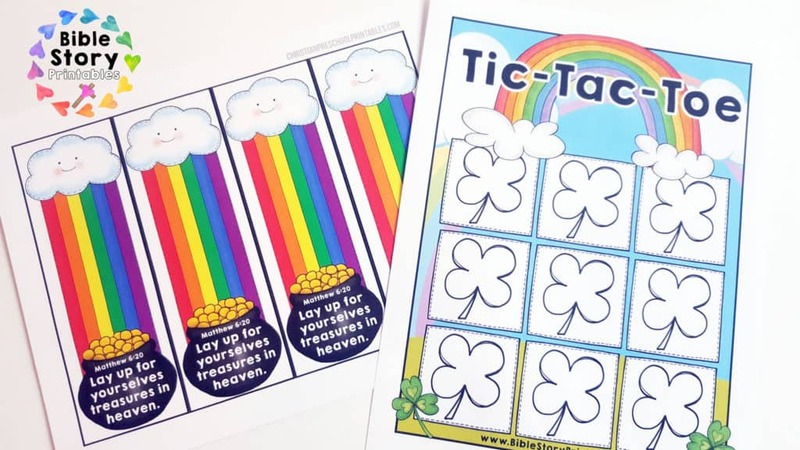 This set of bible printables features the verse from Matthew 6:20, “But store up for yourselves treasures in heaven.” This is a great verse around St. Patrick’s day for children to learn about things of true value. 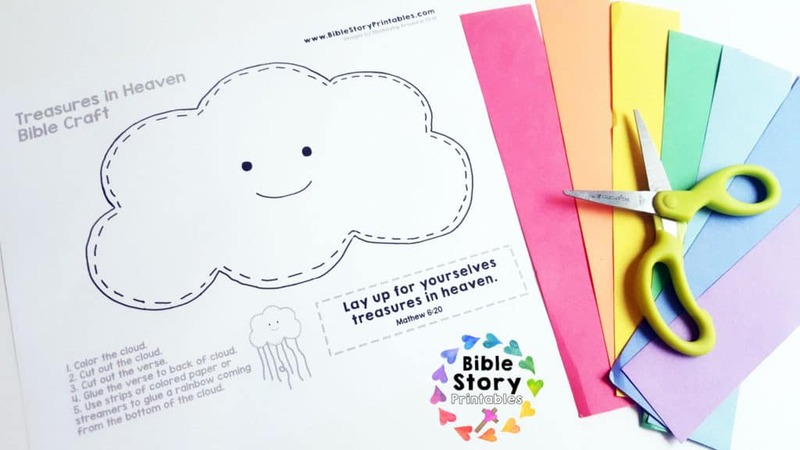 Included in this set are bible verse cards, handwriting pages, bible vocabulary and a bible craft. 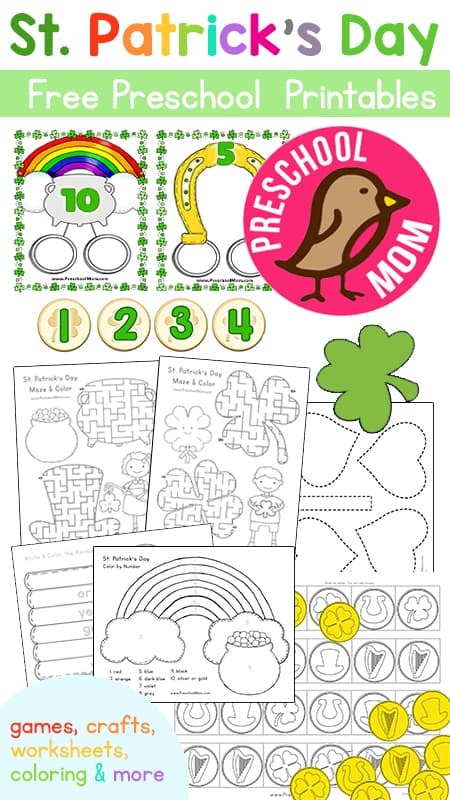 We also have a great collection of St. Patrick’s Day File Folder Games! 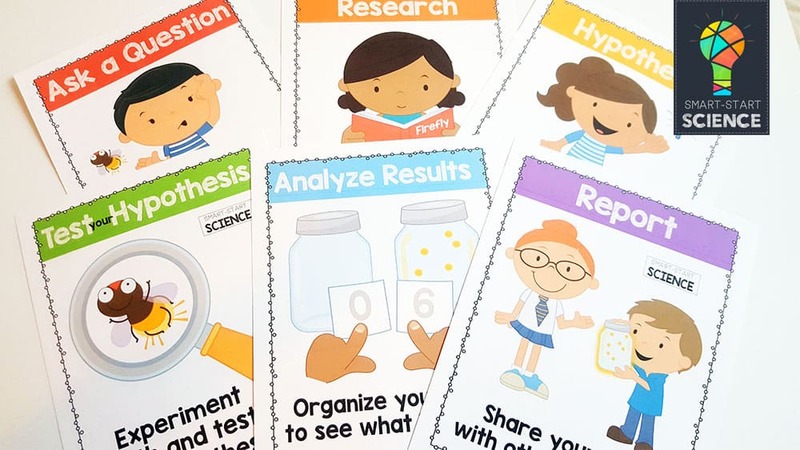 You’ll find lots of printable games to help you round out a thematic unit in your classroom. These March Notebooking Pages are Free on Currclick through Sunday March 3rd, 2013. And remember this St. Patrick’s Day Craft from a couple years back! This is simple to do, takes very little planning, and turns out beautiful! Hope you find something helpful! and I couldn’t resist using this one with the kiddos. These are super easy, even my 5 year old enjoyed the “Plaid” making technique. 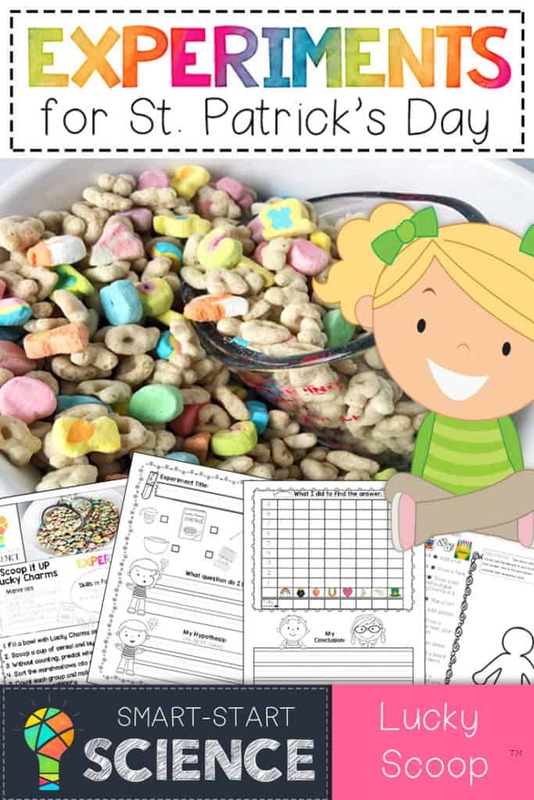 so you can make some with your little ones this St. Patrick’s Day! These would look great on the cover of a St. Patrick’s Day card, or hanging up in your classroom. If you make these with your kiddos, I’d love to see how they turn out!